Eucalypts have been grown on Vancouver Island for at least forty years, yet there are few mature, undamaged specimens today, a sure testimony to their limited hardiness, but also to a poor choice of species planted. Eucalypts originated in Australia about twenty-five million years ago, when deserts and tropical and temperate grasslands began to develop on Earth. Then, as now, Australia was situated in the Southern Hemisphere, though somewhat further south, and its climate was milder and wetter. As it drifted northward into lower latitudes, the land became hotter and drier; no really high mountains ever developed. Eucalypts, therefore, adapted with these changes to drought and heat, but not to severe cold. As a result, of the more than 600 or so species of Eucalyptus, the only ones that can survive our cold snaps are found in the coldest places in Australia. The coldest places are the upper slopes of the Snowy Mountains and the adjacent ranges, which straddle the border between the states of New South Wales and Victoria. It is often wrongly thought that Tasmania, because it is at higher latitude, has hardier plants; in fact, it has lower mountains, a maritime aspect, and a less severe climate, so its hardiest eucalypts are less resistant to cold than those of the Snowy Mountains. At about 6,600 feet (2,000 meters), tree-line in the Snowy Mountains is lower than is usual in other continents at the same latitudes (37°), which tells us again that eucalypts have not adapted to cold as well as trees elsewhere. The hardier eucalypts are trees of small or moderate size that occur at altitudes of over 1,600 feet (500 meters), and preferably over 3,300 feet (1000 meters). They often have glaucous foliage, and attractive, but not showy, white flowers. Mature leaves are alternate, usually long and pendulous, to avoid the direct rays of the blazing Australian sun. Juvenile leaves are opposite, oval, and often quite large, apparently in order to compete for sunlight with grasses during their early growth. Above grass height, sun protection is needed and adult leaves are produced. Juvenile leaves regenerate when old wood is killed by fire or frost, or is heavily pruned. The transition from juvenile to adult foliage often begins in the first year, but more usually in the second. Some species retain highly decorative juvenile leaves for many years, but unfortunately none of them are reliably hardy. Most of the hardier eucalypts are known as gums, or gum trees; they shed their bark regularly, revealing a smooth, handsome, often colorful trunk. Gums look great in summer, but also have much to contribute to the fall and winter garden. All eucalypts of interest to us are insect- or bird-pollinated in Australia. Individuals within a species can be highly variable. Eucalypts are also characterized by a low viability of seeds resulting from self-fertilization; it is usually best to avoid collecting seed from isolated trees. One overriding factor determines which eucalypts can be grown in the Pacific Northwest: the exceedingly cold, dry, out-flow winter winds which blow occasionally from north-central North America. Out-flow winds are generally moderate, but every decade or so, the region is struck by winds that are exceptionally strong, dry, cold, sudden, and prolonged. Overnight temperatures in Victoria can fall to as low as 7 to 14° F (–10° to –14° C) for a week or ten days, with fierce winds and wind-chills of –13° F (–25° C). Only a few eucalypts can endure this. Previously, when selecting eucalypts for this region, there has been too great a reliance on British and Californian experience. Dozens of species grow to mature trees in Britain, prompting attempts to use them here. But the cold dry winds (and it is wind-chill not just temperature that does the damage) in such winters as 1988-89 for example, are unequalled in lowland Britain. The reason is that cold outflow winds from Russia reach Britain considerably weakened—and warmed—after traveling great distances over the relatively warm Baltic and North seas and pushing aside the mild air over the Gulf Stream. Our close proximity to the cold interior of Canada, and the absence of a warm off-shore current (like the Gulf Stream), limits growth of eucalypts in our area. Vancouver Island is less severely affected than the adjacent coastal mainland because it is protected somewhat by the Georgia Straights. 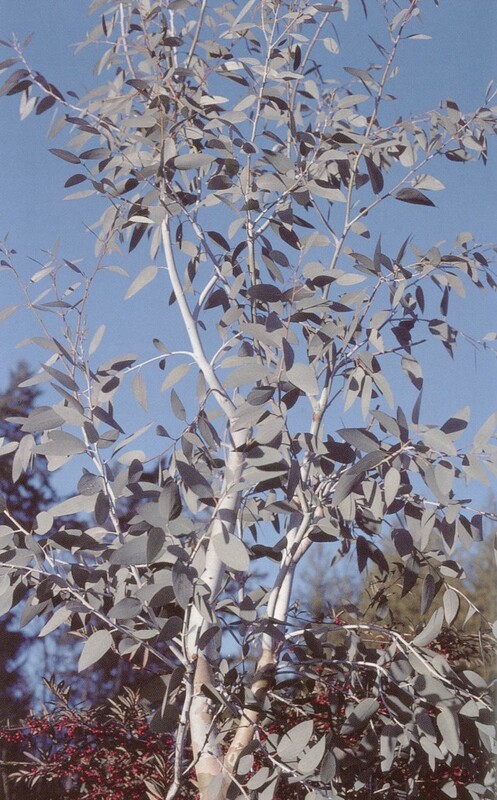 I planted a cider gum (Eucalyptus gunnii) from Tasmania in my garden in 1983. It was frozen to the ground in the hard winter of 1985-86, but grew back to a height of ten feet (three meters) from the base in 1986. That year, I began a trial planting to evaluate the hardiness of several eucalypts. I planted a dozen high- and intermediate-altitude species, basing my choices on advice from Australian botanists and on my own experience there. All were grown from accurately located, wild-collected seed obtained from the Australian Tree Seed Centre in Canberra. The young plants were placed in more than a dozen gardens with different soils and settings on southern Vancouver Island; some sites were exposed, others more sheltered, but all fell more-or-less within Sunset’s zone 4 (USDA zone 8). A few plants were also tried on the mild west coast at Tofino. These trials are continuing today. All test plants in the greater Victoria area (southeastern Vancouver Island) grew well at first, but in 1988-1989, after a severe cold snap, most were killed or suffered severe damage. Temperatures as low as 3° F (–16° C) were recorded, with wind-chill readings as low as —40° F (—40° C). From the ensuing survey of trees planted in 1986, I was able to recognize three hardiness categories: “hardy”—those eucalypts that survived this cold winter with little or no foliage damage; “root-hardy”—those cut to the ground by the cold, but which grew back strongly in the following year; and “non-hardy”—those that succumbed, or were so weakened that they died soon after. Because there are many local microclimates within the Victoria area, and because of variability among individuals of the same species, such categorization is not always clear cut. A plant in one garden may have been killed, but an individual of the same species may have proved root hardy in another. In such instances, I applied the majority rule: if most were killed, I classified the species as non-hardy, and likewise for the other two categories. These categories are, l think, useful for gardeners in southeastern Vancouver Island. They may not, however, be strictly applicable to more protected gardens, and, of course, they do not apply outside the test area. They may serve as a general guide, however, for gardeners in milder regions further south along the coast of Washington, Oregon, and Northern California. 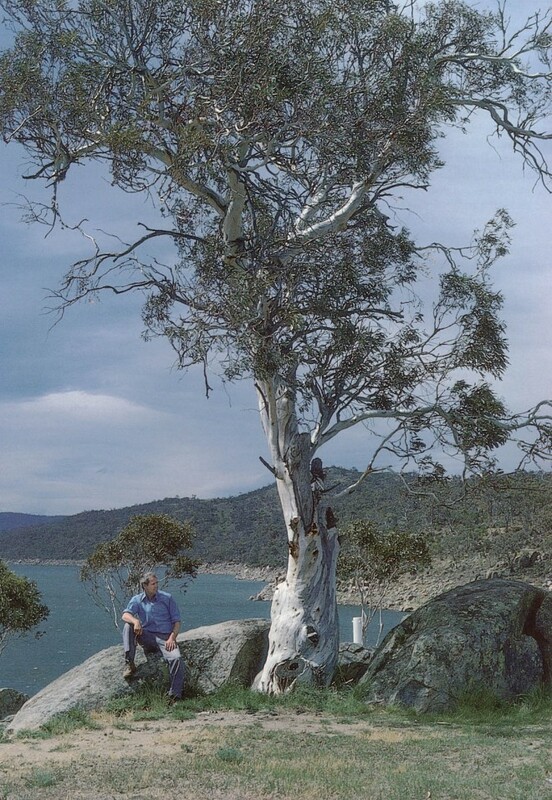 The only test plants to survive the winter of 1988-89 without foliage damage were alpine snow gums (Eucalyptus pauciflora ssp. niphophila). Their natural range is in the Snowy Mountains, from about 4,000 feet to the tree line at 6,600 feet (1,200 to 2,000 meters). I later obtained seed of Jounama snow gum (E. pauciflora ssp. debeuzevillei), which is found at similar altitudes in the Brindibella and Jounama ranges to the north of the Snowy Mountains. It has done well and should survive our severe cold snaps with little foliage damage. I am currently testing two notable high-altitude weeping species: Mt Buffalo gum (Eucalyptus mitchelliana) and E. lacrimans (formerly E. pauciflora ‘Pendula’). Seed of the first was collected at 4,400 feet (1,330 meters) altitude on Mt Buffalo, and the second from about 4,600 feet (1,400 meters) in the Snowy Mountains. Both could make ornamental trees of distinction. In the winter of 1988-89, several species of Eucalyptus were killed to ground, but grew back strongly the following summer. These were snow gum, also known as white sallee or cabbage gum (E. pauciflora ssp. pauciflora), cider gum (E. gunnii), spinning gum (E. perriniana), and small-leaved gum (E. parvula). White sallee occurs from Queensland to South Australia and Tasmania and will reach sixty-five feet (twenty meters) in height; it is also called ghost gum, a name more properly applied to E. papuana, an elegant tropical tree from northern Australia and New Guinea. Cider gums are found at intermediate altitudes in central Tasmania. Small-leafed and spinning gums occur at intermediate altitudes in New South Wales. Left unpruned, all will rapidly become fifty-foot (fifteen-meter) trees, at risk of being killed to the ground during an exceptionally cold period, entailing expensive removal, and leaving a significant gap in the landscape. I generally avoid these problems by heavy pruning of root-hardy eucalypts each spring, just before new growth begins. Most eucalypts are accustomed to being killed to the ground by fire and easily withstand frequent pruning. When coppiced (cut to the ground annually), they reach six feet (two meters) in height by midsummer, and provide a handsome show of juvenile foliage. Allowed to develop a ten foot (three meters) tall trunk and pollarded (cut back to stubs annually), they provide a bold feature in the mixed border or as a tall hedge. Pruning can be hard work, but friends appreciate the foliage, and the cut branches make excellent kindling. Of this group, I especially recommend the spinning and small-leaved gums, both with aromatic foliage. The former has large, perfoliate juvenile leaves, perhaps the most dramatic of all eucalypt foliage. If you have a large garden and are willing to risk loss in a hard winter, then for the shear pleasure of a spectacular garden plant, leave the spinning gum un-pruned, and it will quickly develop a shapely trunk and branches with tan, green, and pink shadings; this is not a plant for the timid gardener. 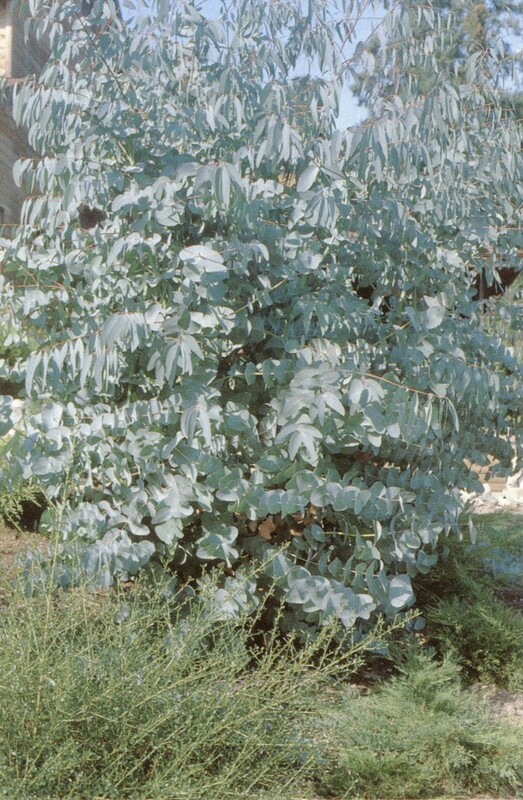 The small-leaved gum is fine textured, with red twigs and willow-like foliage; it can take the place of ornamental willows in the droughty border. Pruned cider gums have attractive juvenile leaves that vary from dull green to glaucous, but are not aromatic. I find the cider gum (unless it is a glaucous form) and white sallee less desirable than either the hardy snow gums or the aromatic root-hardy species noted above, but both can make attractive coppices. The species that died in the winter of 1988-1989 were mountain gum (Eucalyptus dalrympleana), Mt Wellington gum (E. coccifera), Tingiringi gum (E. glaucescens), Argyle apple (E. cinerea), Tasmanian blue gum (E. globulus), and black sallee (E. stellulata). A few survived in sheltered spots, but they were either so badly weakened that they died subsequently, or hung on as eyesores. The decorative, red-twigged Wolgan snow gum (E. gregsonianum, formerly E. pauciflora var. nana) from the Blue Mountains is also non-hardy on southeastern Vancouver Island. 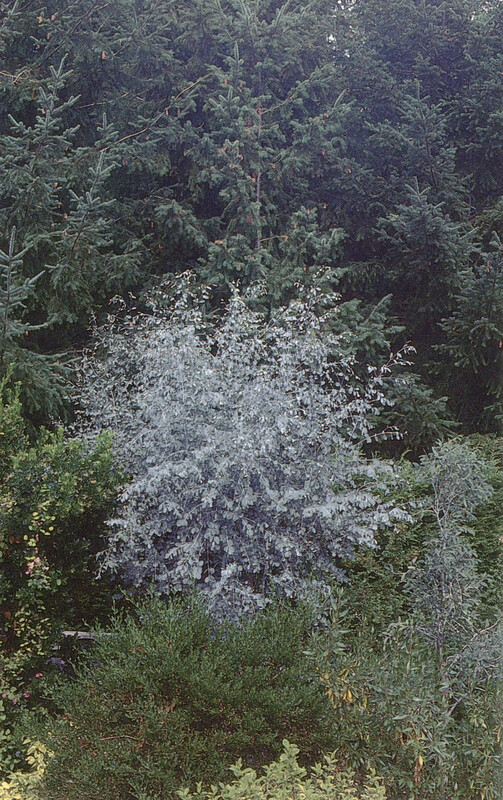 The Argyle apple, often called silver dollar gum, is worth babying through our milder winters, because of its outstanding juvenile foliage, which is encouraged by coppicing each spring. 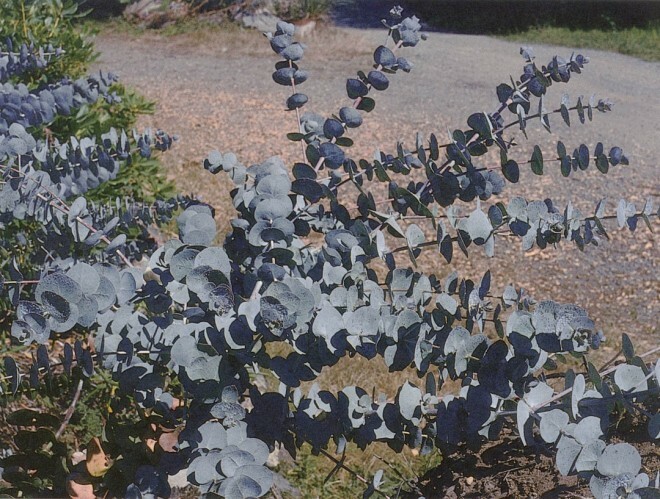 Although I have not personally tested them, several eucalypts with which the above naturally cohabit (for example, E. rubida, E. urnigera, E. moorei, E. nicholii, and E. delegatensis) are also probably non-hardy on southeastern Vancouver Island. That is, they may grow in a sheltered spot for several years, but will eventually succumb to a cold snap. It is likely that all eucalypts noted as root-hardy and some as non-hardy in the Victoria area, are hardy on the west coast of Vancouver Island, where cold snaps are less severe than elsewhere on the island. Tingiringi, spinning, and Mt Wellington gums survived the winter of 1988-89 in Tofino with little damage. The alpine and Jounama snow gums would undoubtedly have survived, but I am not aware of any planted prior to that winter. These species do not seem to mind the more than 120 inches (300 centimeters) of annual rainfall there, provided drainage is sharp. These same species should prove hardy on the west coast of Oregon and Washington, and may already have been grown there. The southeast coast and lower Frazer Valley of British Columbia, the Puget Lowlands, and Willamette Valley are less protected from cold out-flow winds than the Victoria area, and I suspect eucalypts would find survival more difficult. I am not familiar with gardens in these areas, but, if it is not too presumptuous of me, I would advise potential eucalypt-ophiles to begin with alpine and Jounama snow gums, and then try the spinning and small-leaved gums.Avoid the temptation to plant less hardy eucalypts that may be more readily available from California. Vegetative propagation (ie cuttings) is not successful with eucalypts. There has been some success in Australia with tissue culture, but growing from seed is the usual method of propagation. Experience indicates that cold stratification is needed to germinate snow gums, and assists the germination of other hardy species. They do best when sown and planted out the first year. Sow the seeds in February, pot up soon after sprouting, and plant out in June or July when the soil is warm. They should be 12 inches (30 centimeters) tall by fall. Plants may be over-wintered in pots and planted the following spring, but I find that they do best planted out in their first summer. Never impede root growth by confining too long in a pot. Select a site in full sun with sharp drainage. Once planted, do not try to move the seedling to a new location. Use a little organic fertilizer, but only initially. In Australia they grow in uplands that receive forty to sixty (100 to 150 centimeters) of precipitation (much of it in winter), with sharp drainage and long periods of drought. Provide water in their early years, but little or none once established. They do well on rubbly soil and will tolerate clay if well-drained. In Australia, the upland eucalypts of interest to us grow on thin, nutrient-poor residual soils, much less fertile than our garden soils. Insect pests abound, whereas here they have none. Consequently, in our gardens, stem and leaf growth is rapid—three to six feet (one to two meters) or more in years after the first—and quickly outpaces the growth of the roots. This can cause anchoring problems, and care is needed to establish plants firmly. I do this by pruning hard down almost to the ground in the second spring, and repeat, as needed, in the third spring. The plant should then have an adequate root system. As new growth appears after the second pruning, select a single or multiple trunks and eliminate all the other shoots. If the site is exposed, take off about a third of the previous year’s growth in spring for several years to reduce windage until the trunk is firmly anchored. Coppice or pollard root-hardy species in spring before new growth begins. Wounds from pruning year-old wood heal quickly. Minimize pruning of older wood to avoid rot. Young plants tend to be lax and may not stiffen for a couple of years. When planting out small first-year plants, all that is needed is a surrounding stockade of small sticks. As the plant grows, staking may be necessary to prevent wind rock. Avoid long stakes, and secure firmly to a low gallows just above the ground. I am indebted to friends who have welcomed test plants into their gardens, and to those who have helped in other ways. These kind people are too numerous to name, but they know who they are and I thank them.